Adv Protein Chem Struct Biol. 2014; 95: 231-281. Casado-Vela J, Fuentes M, Franco-Zorrilla JM. 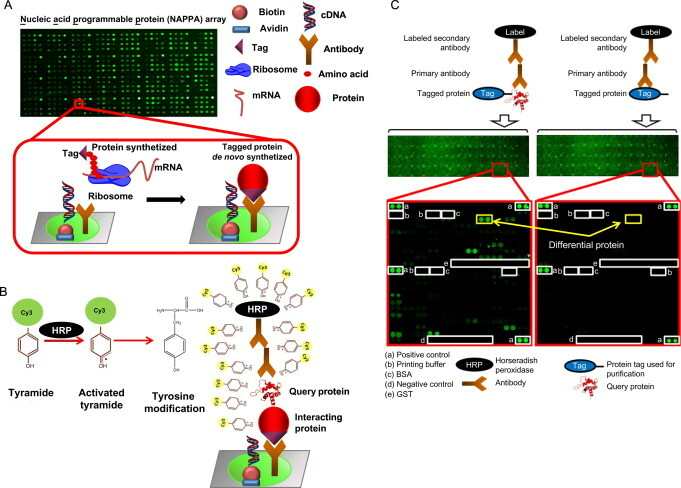 In this report, we focus on two different array-based technologies that enable large-scale screening of protein interactions. First, protein arrays focus on the identification of protein–protein interactions (PPIs). Second, DNA arrays have also evolved to explore the identification of protein–DNA interactions (PDIs), offering novel tools to control key biological processes. Such a tool is termed protein-binding DNA arrays (also protein–DNA arrays or protein-binding microarrays). These two array-based technologies share unrivaled screening capabilities and constitute valid approaches to address biological questions at the molecular level and, eventually, may be used in biomedical applications. Outstanding achievements of these technologies and their eventual application in biomedicine are discussed here, including the identification and characterization of biomarkers, screening of PPIs, detection of protein posttranslational modifications and biofluid profiling. Advantages and limitations of protein arrays, protein-binding arrays, and other proteomic technologies are also discussed here. Finally, we built a list of dedicated databases and on-line resources comprising updated information on human PPIs and PDIs that can serve as a toolbox for researchers in the field.